This ground-breaking exposé (first published as an article in Homiletic & Pastoral Review in 1991) is a comprehensive summary of the hidden beliefs of the New Age Movement, which ensnares followers with the bait of humanitarianism and self-improvement. 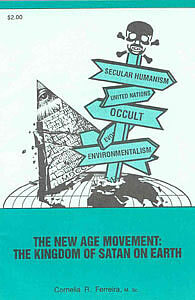 "New Age" is shorthand for "New World Order," comprised of a "one-world religion" and "one-world government." It is "new" because it is a revolution against the "old" Christian world order. It is a continuation of the revolt of Satan, who wants to be worshipped by all. Satan started to win man to his religion of occultism in the Garden of Eden, promising him unrevealed knowledge and godhood. That is the same bait of the New Age Movement, which is an occult socio-political movement. Its aim is a complete cultural transformation, to be obtained by occultism replacing Christianity, and totalitarian socialism the social Kingship of Christ on earth. Unravels the intertwined roots of the New Age/New World Order: occultism, secular humanism, Marxism, Freemasonry, Theosophy, evolution theory, Eastern religions, pantheism, human potential theory, environmentalism and syncretism. Explains New Age jargon like "interdependence," "global village," "rule of law," "universal brotherhood," "perestroika," etc. Traces New Age subversion of the Catholic Church through priests and religious, schools and programs like RENEW. Predicted (in 1991) a united Europe with a common currency, the first step to a united world, as planned by the Illuminati over two centuries ago. Exposes the crucial role of the United Nations. Names the leaders and some of the main organizations bringing about the New World Order. Shows the 1991 Gulf War's part in moving us towards the new world order, and why Iraq was targeted. Refutes the lie that Communism is "dead". Explains why the Collegial Consecration of Russia, as requested by Our Lady of Fatima, is a deadly threat to the architects of Satan's kingdom on earth. Read this book if you don't want to be trapped by the New Age/New World Order! Order NOW online with credit card! "The expression 'New Age' keeps popping up all the time. What does it mean? Is it friendly to Catholicism or fundamentally anti-Catholic? ... I asked Mrs. Cornelia R. Ferreira ... to prepare something for HPR [Homiletic & Pastoral Review]. In this issue you will find her well-documented article which shows the connections between the New Age Movement and Gnosticism, Masonry, Atheism, Secular Humanism, and many other 'isms.' This is an article you may want to keep on file for future reference." "What is the NEW AGE? Mrs. Ferreira, in her booklet, tells us all in her title, The New Age Movement: The Kingdom of Satan on Earth. ... she traces the movement back over the last one hundred years and especially in our tortured twentieth century. But, as Cornelia Ferreira notes, the NEW AGE really began in the Garden of Eden when Satan said beguilingly, 'Ye shall be as gods.' The target of NEW AGE is our beloved Christianity. Cornelia shows us that our Christian West is not changing — it is being changed. Every fact or statement she quotes is amply supported by copious footnotes. Mrs. Ferreira is undoubtedly the Canadian expert on NEW AGE. She is also a recognized authority in the United States, where she is frequently invited to speak.... This excellent pamphlet needs the widest possible diffusion." "For ten years as a Catholic writer, I have been endeavouring to warn people of the evil intent of those who are stampeding towards world government. My studies lay in the economic and political fields. I was puzzled that the wealth and might of more than two hundred million Americans could be used without their knowledge to inflict the Communist system on millions of people in Eastern Europe and the Far East. That was until I read Cornelia Ferreira's lucid and comprehensive account of the workings of the New Age Movement. I have now read many works on the New Age, but I have no hesitation in saying that Mrs. Ferreira's is the best and clearest account I have yet read." Karl Marx: True or False Prophet? Copyright © 2008-2019 Canisius Books. All rights reserved.